Our flagship product, Braid on Braid is a Polyester Double Braided rope designed for multiple application from Yachting to Winching. A slightly softer variation to Braid on Braid, Silverline is available in various 'twist mix' colour styles. Primarily used for in Yachting applications where a softer Halyard is required. This range combines the performance of Dyneema® fibre core with a tough, hard wearing Polyester cover. S-Mix utilises the performance of our standard Braid on Braid but with a mixture of spun polyester and standard polyester in the cover to give the rope a higher levels of grip. Designed as a more flexible double braided rope with a 16-plait outer jacket construction. An all round rope which has a high break load for the diameter of the finished rope. 12-Strand polyester is easy to splice and can be used in a range of application including Marine. The 8 strand twist mix construction allows a blend of the Dyneema® and polyester fibres to inherit each others properties. 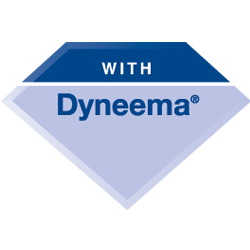 Low extension is offered through the Dyneema® while polyester provides grip.